Laikipia is a prised province in Kenya. This region is stunning! It is one of the last frontiers of wildlife on the continent, a vast area where wildlife including elephants, lions and buffalo still roam free. Although many game reserves exist in the region, much of the land here is not protected. It was a rare glimpse into what East Africa was like before humans expanded rapidly. It made my heart so happy to see there are still places like this on Earth for animals to survive without human interference. 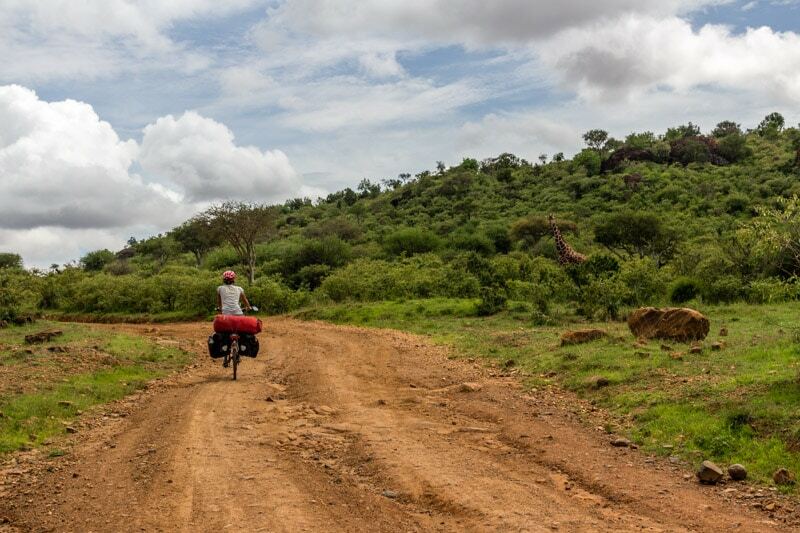 After visiting Borana Conservancy and Ol Jogi Wildlife Conservancy, it made sense to continue cycling this region towards Lake Baringo and we are so glad that we did! 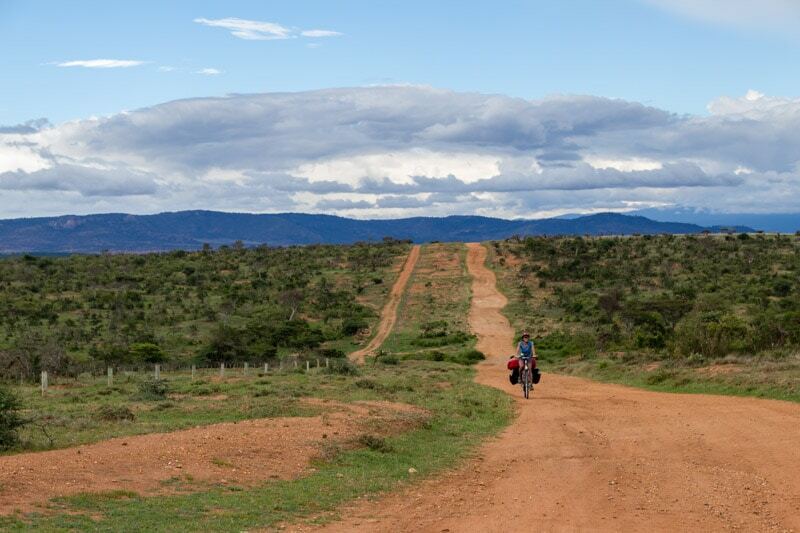 We enjoyed every second on the dirt road that snaked its way past hills, open plains, streams and rivers. We saw a herd of 12 elephants, walking single file, trunks on top of one another. 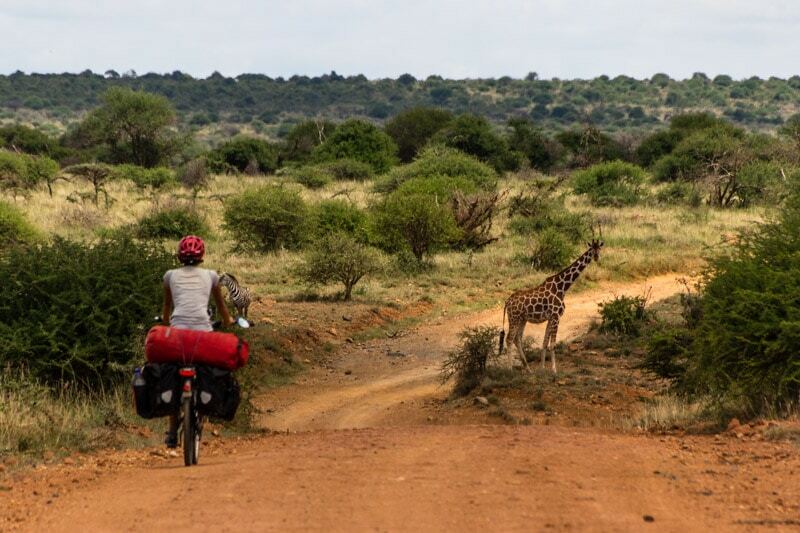 We cycled passed many curious giraffe right next to the road… they don’t care at all about cars passing, but strange looking, brightly coloured mzungus on wheels… well that’s unusual. They usually look very intently at us, trying to get a better look. When we come closer they get spooked like hell! They decide we are way too odd for them to stick around! They hastily make a run for it. Some aren’t phased at all and continue munching on bushes very close to the bikes. Many, many zebra and some antelope lined the roads. The clouds were thickening and a heavy downpour was about to start. We saw lightning strikes building up. We didn’t want to get stuck in the mud and wait out a thunderstorm. 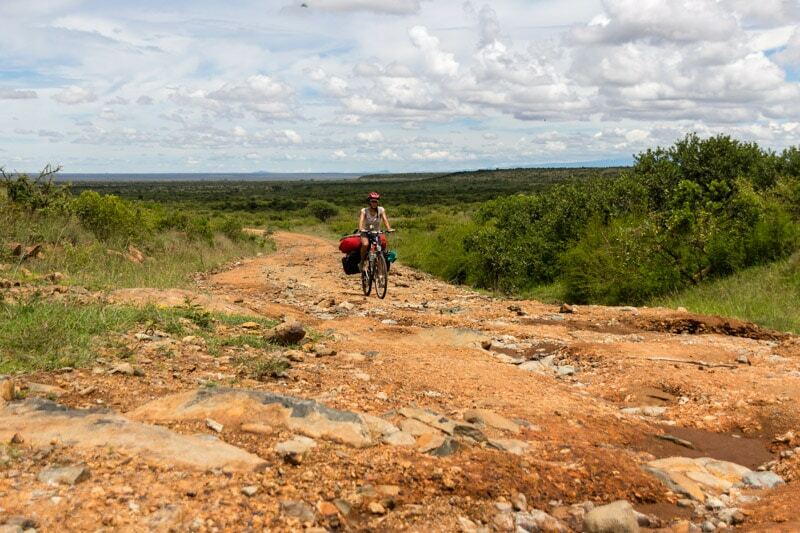 Luckily, we got a tip from Jamie at Ol Jogi Wildlife Conservancy to cycle to Sosian Ranch with the instructions, “tell them Jamie sent you”. We asked to camp for the night but before long, we found ourselves in a large cottage with a living room, kitchen and a hot shower all to ourselves. 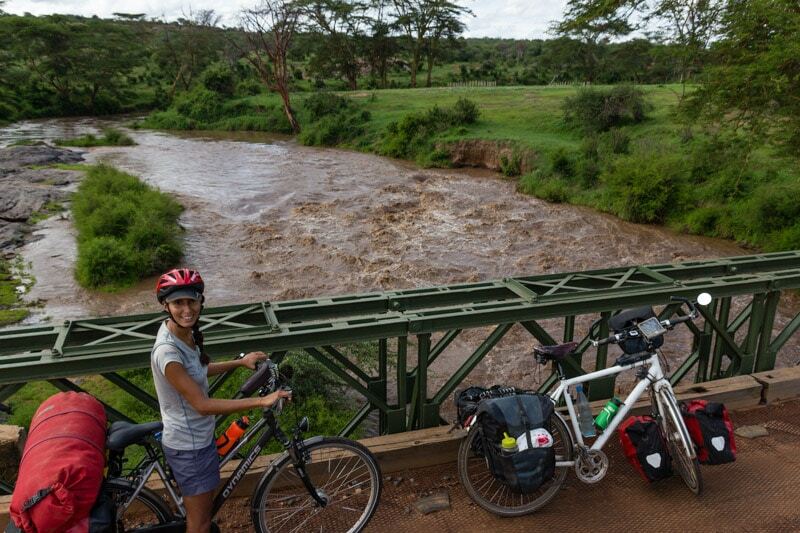 We got the bikes into the cottage just as the sky opened up and soaked Laikipia to the core. It was one of the heaviest rains we have ever seen.. and once again, we were lucky to stay bone dry. The great staff at Sosian Ranch took good care of us.. even working in the heavy rain to light a fire. 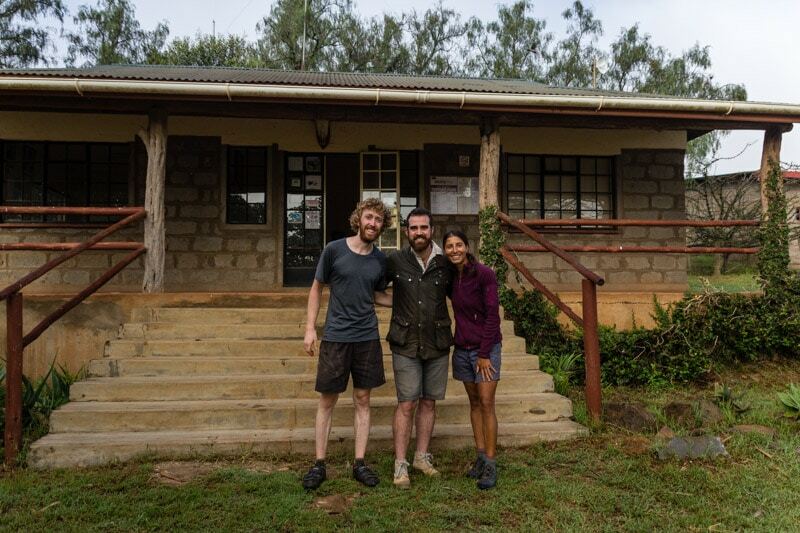 After a piping hot shower and dinner in the cosy cottage, John, a guide, regaled us with encounters of wild animals in the region and the rest of Kenya. Just a few kilometres down the road, he once ran into a lioness with cubs. He also told us that the river we crossed close to the ranch had over 100 elephants drinking from it the day before. He says they knew the rains were coming and left town. Mud… This thick black poison is making the blood in our veins boil. We left the cosy shelter of Sosian Ranch and said our goodbyes to the kind staff. It had rained cats and dogs the whole night and we were so glad not to be stuck out in the rain. Instead, we were given a comfortable and cosy cottage to recover and take shelter in. In the morning, reality struck just few kilometres outside of the game ranch: Mud. Everywhere. Now, some mud roads are fine in the rain. But cotton dirt mud roads are THE worst when it rains. They are amazing when dry – compact and hard. We could almost go as fast as on tar roads. But add a bit of water, and damnnn – they are your worst nightmare. We drove 10 m into the black poison and I wasn’t going any further. I got off to push the bike and to my horror, the stuff was cemented on my wheels. I was not going anywhere… I pushed with all the force I had! The bike didn’t move an inch. 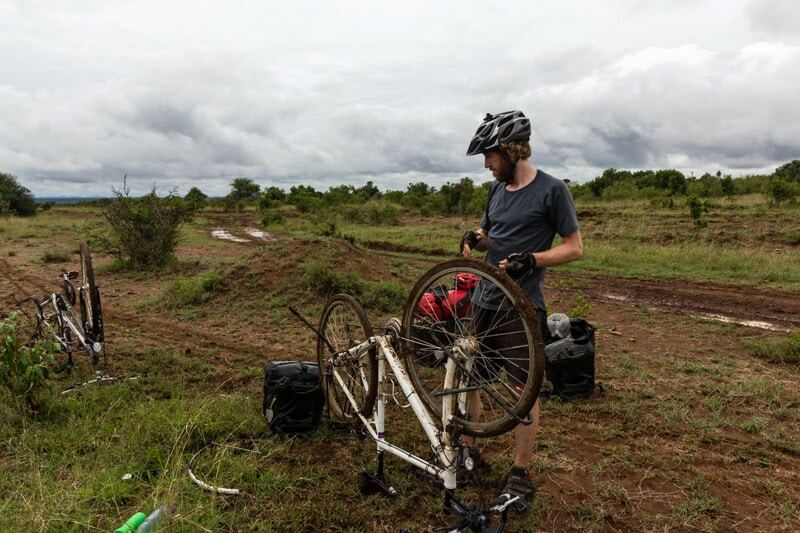 We took off all of our panniers and moved everything off the road and into the bush. We spent the next hour cleaning the stubborn mud off of our wheels, brackets and chain. The so-called ‘mudguards’ turned out to be our biggest problem and also had to be completely removed! 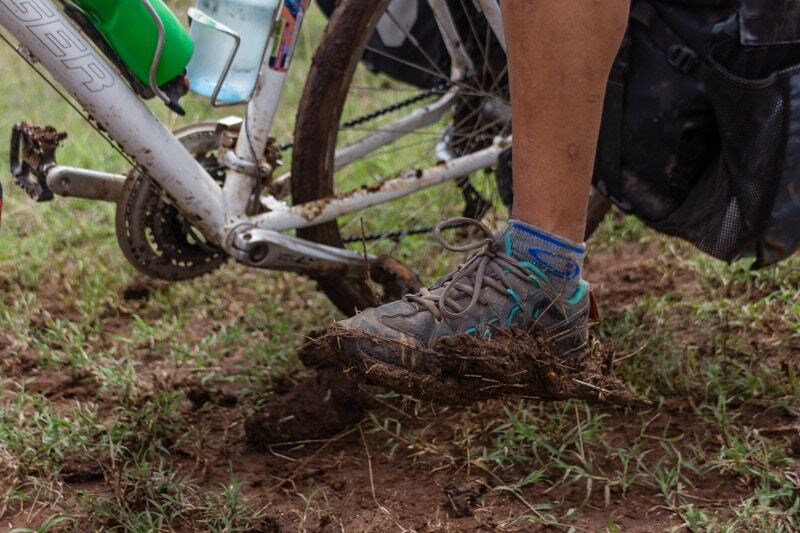 We carried our bikes and panniers passed the mud zone. It took us 2 hours to get through 100m! 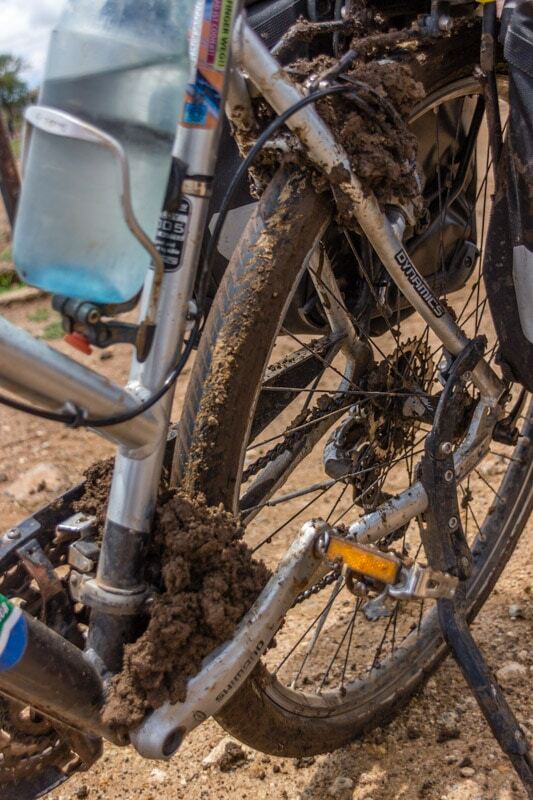 After repeating this process twice, we were finally on our way to Lake Baringo – on a rocky but mud-free road. The rains poured down again that afternoon. 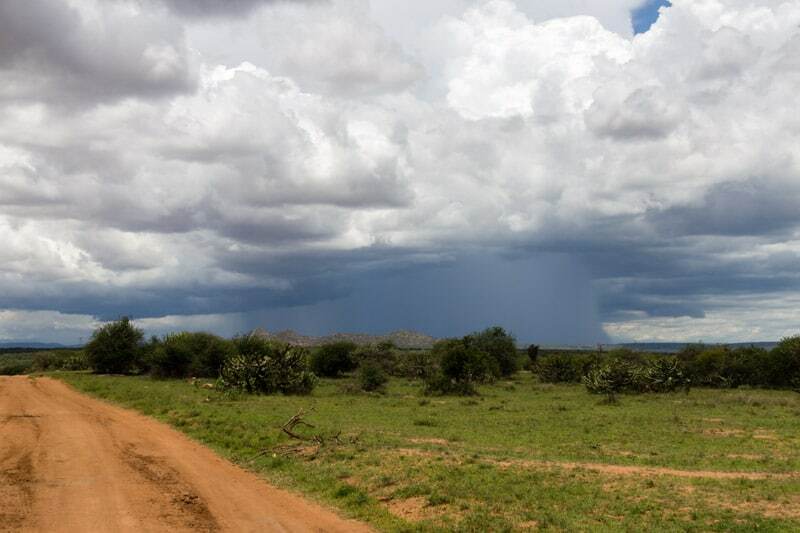 After getting thoroughly soaked to the bone, we took cover at Mugie Conservancy. The manager, Henry from England, gave us refuge from the rain. We stayed at his place and it was a breath of fresh air. His home is in the middle of the game reserve! On the way, he patted the local giraffe on the head who was orphaned and raised by the staff at Mugie. She still hangs around the headquarters and feels comfortable around humans. At his home, he lit us a roaring fire and after a hot bath we found out a hidden talent – some great piano and a beautiful voice. Listening to his rendition of Can You Feel the Love Tonight, with a soothing fire next to us while staring out at the sunset over the game reserve was just perfect to capture the moment. He also told us about the horrors of what happened in Laikipa in early 2017. It was before the last elections and the Pokot and Samburu tribes took weapons as well as their cattle and marched into the private game reserves of the region. They overgrazed all the grass… and to disastrous effects. In the aftermath that followed, much of the wildlife suffered at Mugie. The shortage of grass to feed on meant that the large majority of buffalo and many antelopes died in the following months. This caused major problems in the food chain and the ecosystem. In the end, many animals, from grazers right up to predators such as lions, suffered severely. The tribes were not just armed with cattle, but also more conventional weapons. They came into the game parks with guns and many people were murdered. Even the person who stayed in Henry’s house before him was murdered during one the raids. One of the owners at Sosian Ranch, where we had last stayed, was murdered when he went to inspect the damage on his ranch.They shot many animals, including elephants and lions and decapitated others. They burnt down homes and lodges. The only conservancies left untouched were the rhino conservancies, since they have an army of dedicated rangers as well as external support, allowing them to cope with such an attack. Mugie now have worked out a deal with the Pokot people and are in close contact with their Chief and leaders. They employ many Pokot and are an important asset to them and their cattle. But one of the messages I’ve taken from this is: protecting rhinos means protecting the rest of the animal world and ecosystem that share it. Without rhinos and the protection that comes with them, it will be a scary time when tensions are up at the next election. It was surprising to hear about these violent events, especially as it was initially reported very differently in the media at the time. 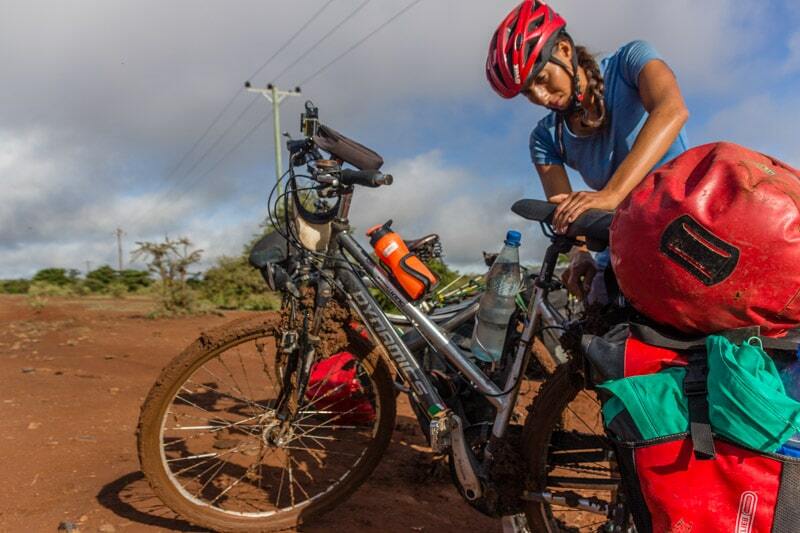 We were now about to cycle through Pokot territory and were a little nervous after what we had heard. No need to worry though – Henry called up the chief of the Pokot area and let him know we were about to cycle through his region. We met him for lunch on our way the next day and he was very friendly. He also reassured that we will be safe to continue cycling in his region. With this, we pushed on to Lake Baringo where we got ourselves into a different kind of sticky situation. We have been so lucky to learn a lot from experienced rangers, scouts, guides, managers and owners in Laikipia. We are sad to say our last goodbye to Laikipia, but thankful for the fantastic experiences we have had here. For more photos from this stretch in Kenya, see here.